More than 300 suburban Coca-Cola workers went on strike Thursday morning. The Teamsters union members are protesting what they call unfair labor practices. 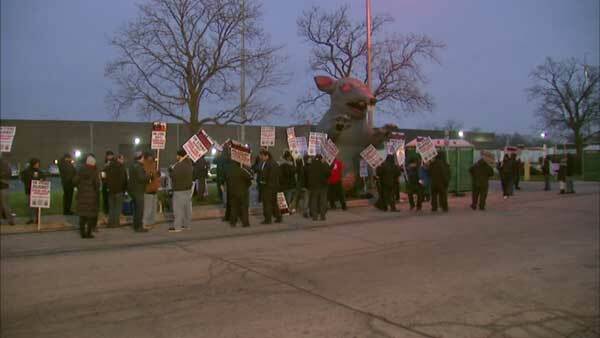 NILES, Ill. (WLS) -- More than 300 suburban Coca-Cola workers went on strike Thursday morning. The Teamsters union members are protesting what they call unfair labor practices. The union accuses Coca-Cola of intimidating workers and refusing to propose a fair contract. Workers are walking the picket line at a plant in north suburban Niles. A facility in south suburban Alsip is also affected. A Coca-Cola Refreshments spokesperson released a statement Thursday morning. "We hope to reach a resolution in the near future and will continue to negotiate in good faith with the union leadership," the statement said in part.